The EUCHARISTIC MISSION BAND (EMB) is a Third-Order Franciscan apostolate founded in 1917. This dedicated group of volunteers provides free vestments and other items for liturgical services for the Capuchin Mission field in over five continents. 100% of proceeds from the work of the EMB (over cost) is donated to the Capuchin Missions. Vestments can be ordered as memorials for a deceased loved one in lieu of flowers. Each vestment includes a tag memorializing the person. 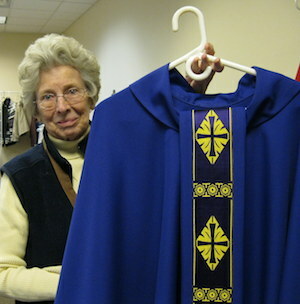 Sample vestments may be displayed at the funeral home. Vestments may also be purchased for the special intentions of a loved one such as a birthday or anniversary. Vestments may be sent to the Capuchin Missions or to a priest of your choice. 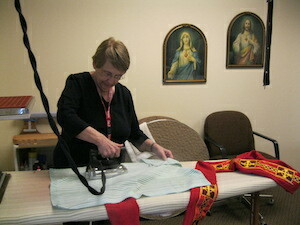 The EMB also sews items for any priest, deacon or parish, at home or in the missions who are in need of vestments or liturgical linens. There may be a small cost for these items.